Yes, with this simple microwaveable fudge recipe you still have time to celebrate National Nutty Fudge Day — and you know I love those sweet holidays. Place milk chocolate chips, sweetened condensed milk, butter , salt and vanilla extract in large microwaveable bowl. Microwave on medium until chips are melted, about 2-5 minutes, stirring once or twice during melting. Stir in nuts, if desired. Pour into 8×8-inch pan that you have lined with foil and coated with cooking spray. Refrigerate until set. Cut into squares and enjoy! I have been making this fudge for Christmas for the past few years and it's always a big hit! One of my friends refuse to believe I made it. He swore I bought it. Haha! i do half semi sweet half mIlk chocolate, everything else the same. Very easy and good. Stunning site! I shared it on fb to my close friends! sure you include more material! This CANNOT be true! Sounds way too easy and way too delicious! Have my prayers really been answered about easy to make fudge?! I love to bake, however I am not that great at it. I'm hoping that this recipe is as easy and as good as it sounds. Making this tomorrow!!! I always wonder how long all these edible things last qithout a fridge and with a fridge, since I plan to make some cool DIY hristmas gifts for friends and family! Thanks a lot. I just made this fudge. It literally took 5 minutes to do!! The spatula was delicious!!! I topped mine with mini marshmallows. It looks like art!! I'm calling it "Man Stration"!!!!! You know, I make almost this exact fudge all the time, but have never added the butter. I love mine, but this sounds even better. I am definitely going to try it. Thanks! I just found your blog and I am enjoying it greatly. I made this fudge and I loved that it was SOOOOO freakin' fast to make! SUPER FAST! AND, I love that it has NO extra sugar! I would have added more nuts, like at least 1/2 cup more. Cindy! 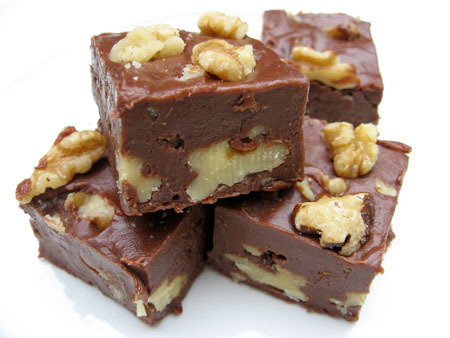 I made your Nutty Fudge on yesterday and both my husband and kids said it was the VERY BEST FUDGE they have ever had!!! I love that it only took minutes to make! Thanks so VERY MUCH for posting this. I ♥ chocolate....of any kind! Well, I made the fudge and it is fantastic!! I made two batches - one with walnuts and one without. While both are great, the one with walnuts is my favorite. I sent some into hubby's office this morning - should put a smile on their faces!! This recipe is a keeper - thanks again!! I RT 'd your fudgies!!! Just stopped by to give some SITS love! I'll have you know, your fudge recipe just resulted in a head injury. That looks absolutely srumptious! Y-u-mm! Oh, that's just wrong on SO many levels. I'd inhale every drop of it by myself. Apologize to my thighs, please!!! I'm visiting at the behest of PinkAndGreenMama, who thinks you're the bees knees. I think you are, too, and plan to visit often! yummO..i am gonna send some blog friends here too! Sounds so easy!! I think I have to make it!!!! I never have! We just finished the English Toffee Recipe, everyone should try it...It is terrific...We are in the process of making this wonderful looking Fudge Recipe...Thank you so much for the great recipes..
Oh, I've got to make this! I'm getting over a terrible head cold and fudge is just what the doctor ordered!! LOL! I am not even going to try that delicious looking recipe! You must be kidding - I'd eat it all myself! What a beautiful picture! :) I love fudge and will give this a try.